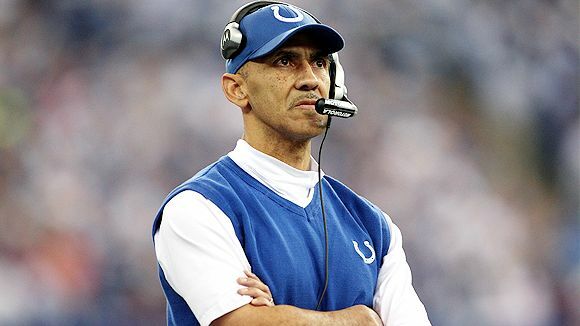 Tony Dungy said the Colts never cheated during his years as coach of the team after Hall of Fame cornerback Deion Sanders accused Indianapolis of doing so, Mike Wells of ESPN.com reports. Sanders, an analyst for NFL Network, made the comments after Sunday’s Super Bowl about the Colts cheating when colleague LaDainian Tomlinson said some might question New England’s success because of Spygate, the 2007 incident in which the Patriots broke the rules by videotaping the opposition’s signals from an unauthorized location. Dungy was on “Pro Football Talk Live” on Wednesday to explain that the Colts, like all other teams, did steal signals, but never cheated. The Hall of Famer Dungy, who led the Colts to a Super Bowl title and at least 10 victories in all seven of his seasons as coach, said Sanders probably used to see who was calling in signals during his 14-year playing career. “And that’s what happened,” Dungy said. “And you looked over there because you wanted to know as a defensive player: Is it going to be three wide receivers? Is it going to be two tight ends? Who’s in the game? There’s a person over there signaling and Deion Sanders and every other defensive player would look at the offensive sideline to get that signal.